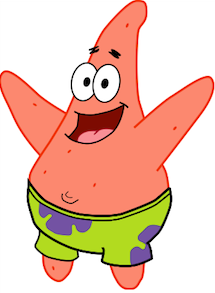 Patrick the starfish is Spongebob Squarepant’s best friend. There are many lessons kids can learn from him. There is also a lot that can be learned from the friendship that they share. Don’t be afraid to ask for help. Patrick is pretty simple minded. He often needs help figuring things out. He is not afraid to ask his friend, Spongebob, to help him figure out his problems. How to be a good friend. Patrick sticks by Spongebob’s side through thick and thin. He is always ready to lend a helping hand. Since Patrick doesn’t do much, he is available anytime his friend, Spongebob, needs him. Simple things can be fascinating. Patrick is easily fascinated. He can sit for a long time blowing bubbles and never get bored. Even playing hide and seek with a worm can fill an afternoon full of fun. Laughs are easy to come by. Patrick is very easily amused. If you need someone to laugh at your lame jokes, he’s your guy. Hanging around someone like him, who laughs so easily could bring a lot more joy into your life. Share with your friends. Patrick is eager to share with his friends ,especially when he has extras. He even invites Spongebob to share his rock home, when Spongebob’s pineapple house is uninhabitable. Have patience. Anyone that hangs out with Spongebob for a long period of time has to have a lot of patience. Patrick is full of patience dealing with Spongebob’s crazy voice, laugh, and antics. Living next to a neighbor like Squidward can also be a way to grow patience. Sometimes you just need to scream to feel better. Sometimes when Patrick is having a hard day, he knows that he just needs to let out a scream and it will make him feel better. He shares this useful knowledge with Spongebob, so he can release his frustrations too. Stand up for your friends. When someone is treating Patrick’s friend, Spongebob, badly he is not afraid to stand up for him. He’s not worried about what other’s think of him, just as long as he has Spongebob for a friend. Be open to others’ ideas. Patrick has ideas, but they’re usually not the greatest. He is always willing to listen to his friend, Spongebob, in case he has a better idea. He easily changes his plan, if his friend has a better one. You wouldn’t think that you could learn much from a starfish, especially one as lazy as Patrick. Like anyone, he does have many faults. Despite those faults, he does have many great lessons that kids can learn from him.